Superior Supply ships from our fulfillment center in Gallatin, TN which resides in the Central Time Zone. Orders received by 2:00pm Central Time Monday – Friday excluding major national holidays will ship the same day the order is received. Orders after 2:00pm may still ship the same day but will most likely ship the following business day. Superior Supply always provides UPS tracking information for all orders. Superior Supply currently offers UPS Ground shipping within the continental United States. We do not ship via USPS and therefore cannot accommodate orders to post office boxes or APO/FPO addresses. We are always evaluating our shipping options and welcome any feedback on our Contact Us page. FREE SHIPPING! Superior Supply occassionally offers free ground shipping promotions. The website will automatically display zero freight cost when orders qualify for the promotion. Orders will be shipped by ground or freight only with free shipping. Some product exclusions apply. For large products, there may be an additional handling fee in addition the ground shipping estimate. Our Customer Service Department works closely with clients to make these transactions as easy as possible. Contact our Customer Service team within 30 days of your purchase on our Contact Us page for the prompt handling of your merchandise returns. Superior Supply will refund the purchase price plus applicable sales tax for all returns that meet the policy explained here. If there was an error with the original product shipment and the error was ours or if the product was defective we will issue a UPS call tag to you in order to cover return shipping and will provide a replacement free of charge including shipping if a replacement is available. The replacement will be shipped once the incorrect or defective product is returned. Prior to any return, these three steps will ensure a smooth process. These essential steps pertain to any and all returns. 2. Customer Service will issue you a Return Authorization (RA) number. 3. Customer Service will issue you shipping instructions. Please provide your RA number on your shipping label and affix to shipping carton. In the case of multiple cartons, provide your RA number on EACH shipping label, AND indicate number of cartons, for example 1/3, 2/3, 3/3. If the shipping carton is the original manufacturer packaging, DO NOT write the shipping address or RA numbers directly on packaging as the product must be in resalable condition, with no defacing, to receive credit. To receive credit, the merchandise must be in its original package and be in resalable condition. Products that do not meet these criteria will be returned to the customer and no credit will be issued. Return requests must be approved, processed, and returned to our distribution center within 30 days of the original invoice date. Some specialty items may require a 15% restocking fee. Returned items received outside of the 30-day return window will not be issued credit and will be sent back to the customer. Customers will be issued credits upon receipt and verification of the condition of product at our warehouse. In most cases, credit will be applied using the same method with which the product was originally purchased. Superior Supply will support the warranties from our suppliers and will execute their applicable written warranty policy. These warranties generally cover replacement of defective product that is returned. Regardless of the manufacturer’s policy we cannot provide credit for warranty issues that were not purchased from Superior Supply. Superior Supply ships using UPS from Galatin, TN. 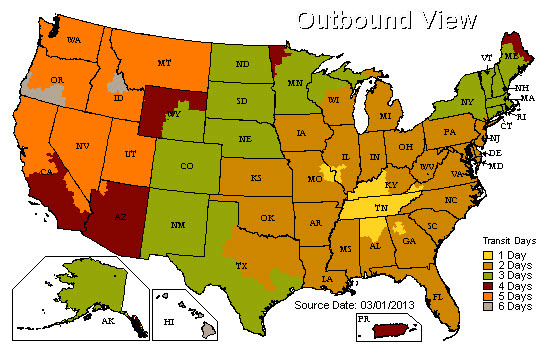 This map should be used as a guideline only and is not a guarantee of transit times by UPS.